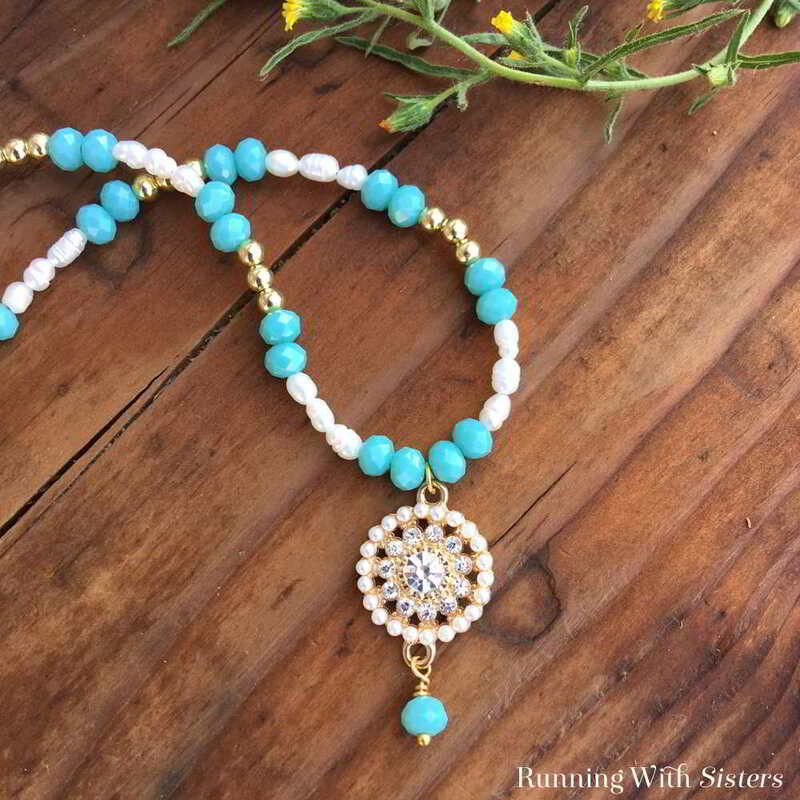 Make a gorgeous Pearl And Aqua Crystal Beaded Necklace featuring a pearl and rhinestone circle pendant. 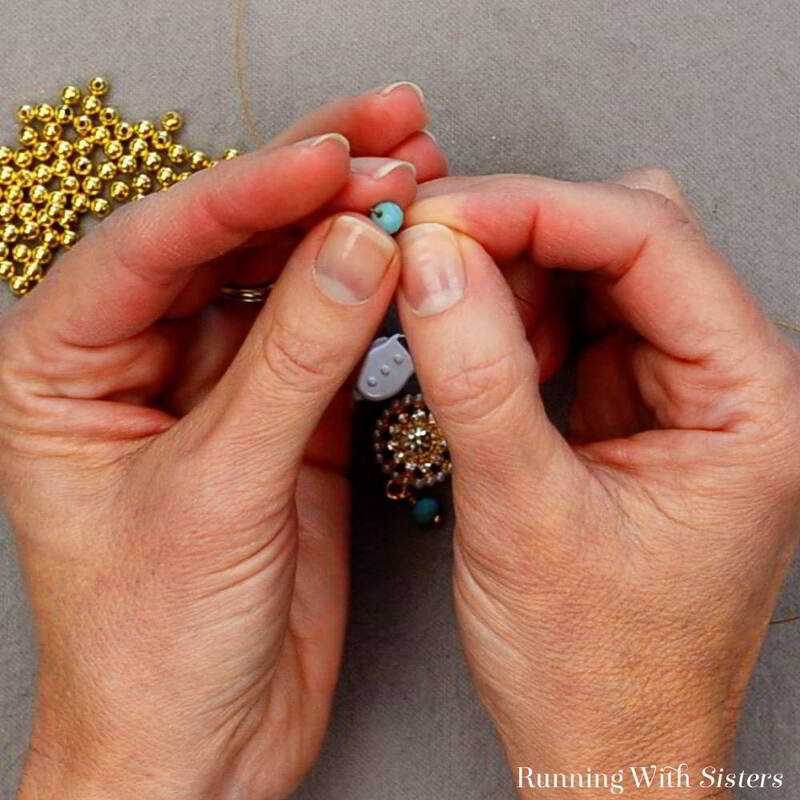 We made a complete video tutorial to show you how to bead the necklace and add the clasp! We were recently asked by Molly Schaller, Lead Designer at Halcraft Collection, if we wanted to be featured in their Designer Spotlight. YES! What an honor! (Want to see it? Check it out!) And they gave us a gift card to their website to boot! We use their beads all the time, so they really didn’t need to butter us up. But it was extra fun to shop their beads since their Bead Gallery brand is bigger and now online (HalcraftCollection.com). They add new items and feature special collections every week. And we can’t resist their weekly sale specials! We think they are a great resource and wanted to make sure you knew about them and their fab beads. We had a ball shopping their beautiful beads and made some really pretty jewelry. 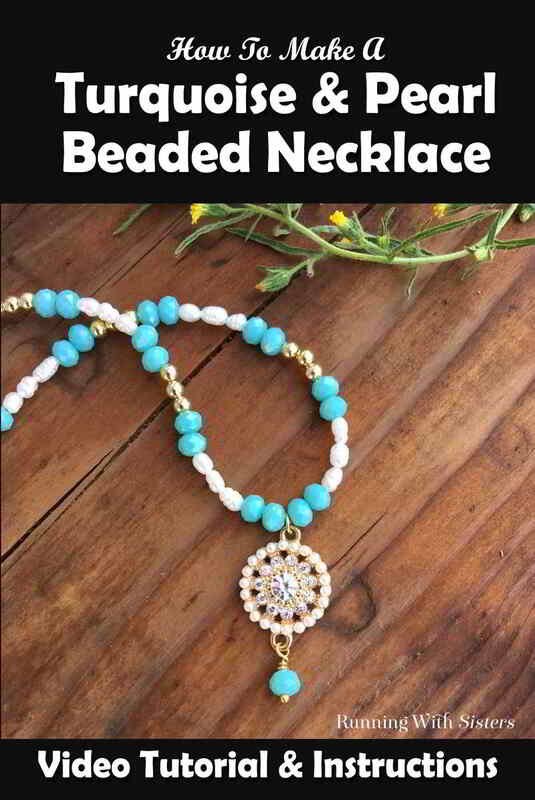 Here’s the video we did showing how to make this Pearl And Aqua Crystal Beaded Necklace. We also have a complete how to below. 1. Add a faceted crystal dangle to the pearl and rhinestone connector. 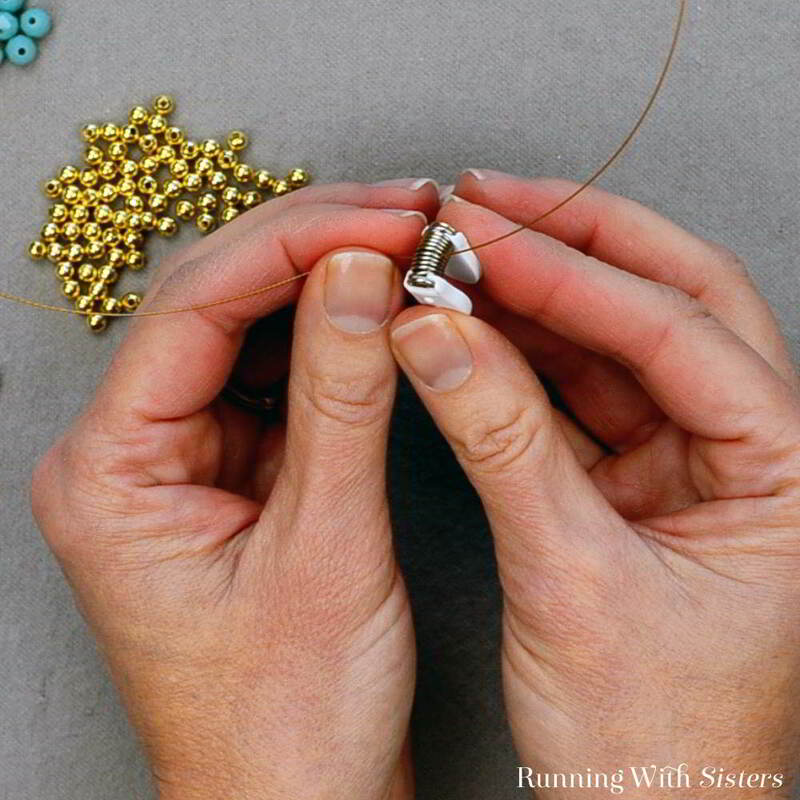 To do this slide an aqua faceted rondelle bead onto the head pin. 2. Make a wrapped loop in the headpin above the bead looping through the connector. To do this, make a 90 degree bend in the wire. Grasp the wire with the round-nose pliers and pull the wire around the top jaw of the pliers. Reposition the bottom jaw into the loop and pull the wire the rest of the way around making a loop. Slide the loop through one of the connectors on the pearl and rhinestone connector. Then wrapped the tail of the headpin wire around the neck two times. Trim the end with the wire cutters. 3. Add a small jump ring to the other connector on the pearl and rhinestone connector. We like to open the jump ring using two pairs of pliers, sliding one side up and one side down. 4. Now that the pendant is ready, it is time to bead the necklace. Start by cutting a 24” piece of bead stringing wire. This will make a 17″-18″ finished necklace. Find the center of the 24″ piece of bead stringing wire and clip on the Bead Bug (or a piece of masking tape). Slide the pendant onto the wire up to the Bead Bug. 5. Bead this side of the necklace by sliding on the beads following this pattern: two aqua beads, three pearls, two aqua beads, three gold. Repeat until you have 8½” beaded. 6. Move the Bead Bug to the end of the beaded side to keep those beads from sliding off. Bead the other side to match. 7. To put on the clasp. Slide a crimp bead onto the end of the wire. Slide the wire into the wire guardian. Slide on the clasp and nestle it into the wire guardian. Slide the end of the wire back into the crimp bead. 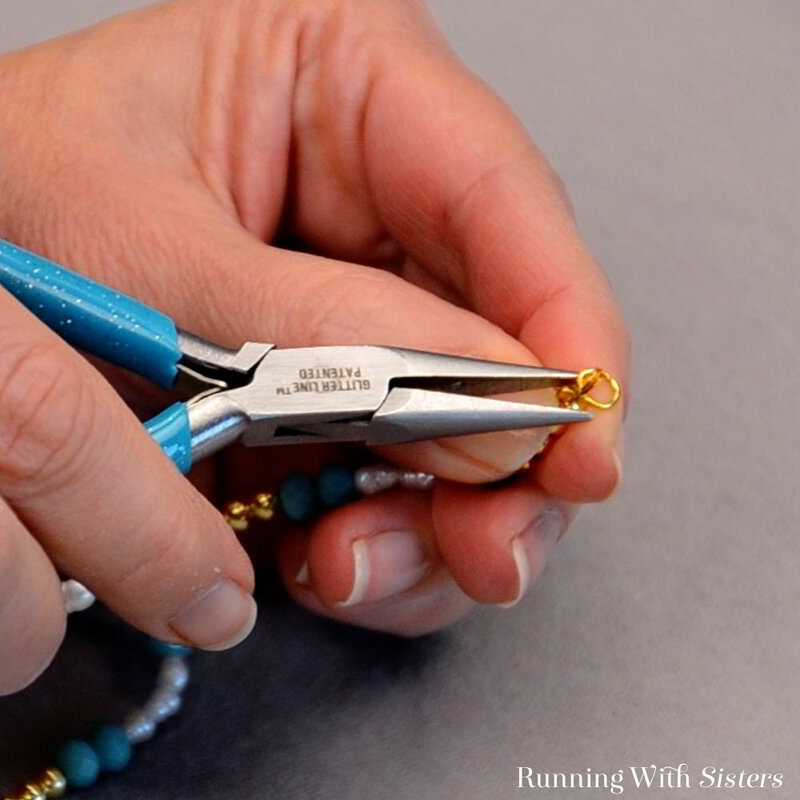 Flatten the crimp bead using the chain-nose pliers. Trim the end of the wire using the wire cutters. Cover the flattened crimp with a crimp bead cover. 7. Remove the Bead Bug from other end of the necklace. 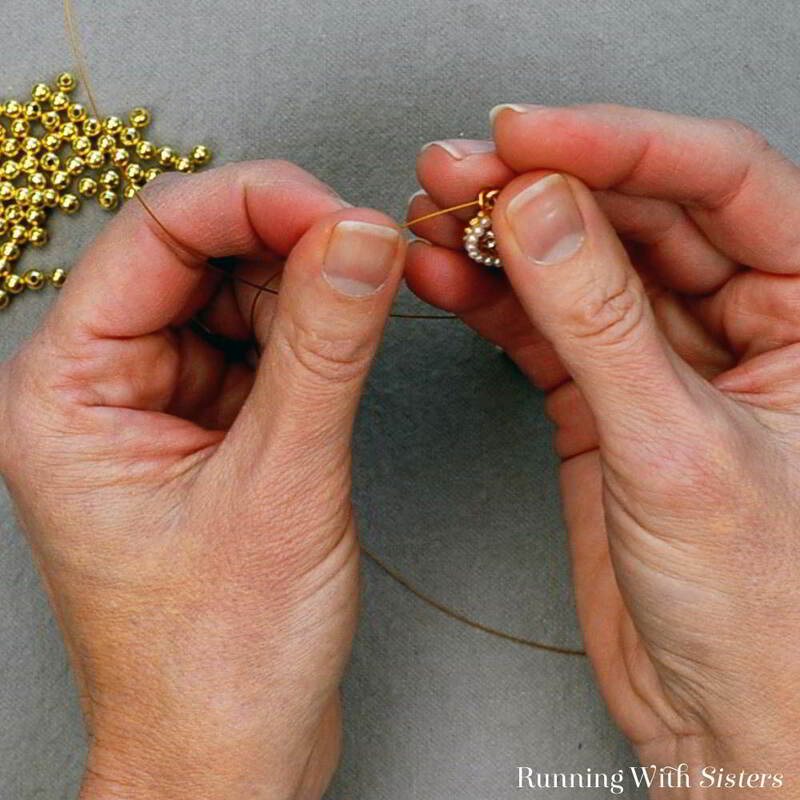 Push beads together against the side with the clasp to remove any slack. Slide a crimp bead onto the end of the wire. Slide the wire into the wire guardian. Slide on a jump ring and nestle it into the wire guardian. Slide the end of the wire back into the crimp bead. Flatten crimp bead. Trim end. Cover with a crimp bead cover. We think this Pearl And Aqua Crystal Beaded Necklace turned out so pretty! We love how the aqua beads complement the pearl and rhinestone pendant. If you have any questions about making this necklace or any jewelry project, leave us a comment and we’ll reply. We are here to help! We love getting pinned! Share us on Pinterest! This was my first watching your video. I learned about the crimp bead cover and the wire guardian. Makes the ends look a lot neater. Thank you for making this video. So glad we could teach you something new! I love your videos and have learned so much. I have a question. Where can I buy the jewelry tools you use? They look so sturdy I’m wanting to purchase a few of the tools. Thank you so much. Keep up the great work and I’ll keep up with both of you! We use a set of tools made by EuroTool called Glitter Line. We like how they feel (and they look good on camera!). We have found these pliers last a long time, but we need to replace the side cutters (aka flush cutters, wire cutters, snips) fairly often. We first purchased these at Michael’s but have bought replacements on Amazon. There are lots of quality tools out there. Darice, Cousin, and Beadalon all make nice jewelry making tools.